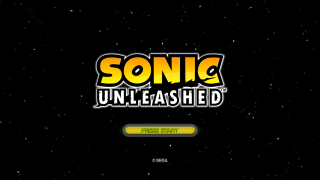 For the mobile game of the same name see Sonic Unleashed (mobile). US ▼ 2009-10-20 $29.99 ? UK ▼ 2009-10-20 £19.99 ? EU ▼ 2009-10-20 €29.99 ? DE ▼ 2009-10-20 €29.99 ? AU ▼ 20xx $49.95 ? JP ▼ 2010-02-23 ¥? ? Sonic Unleashed, called Sonic World Adventure (ソニック ワールドアドベンチャー) in Japan, is a video game released as part of the the Sonic the Hedgehog series in late 2008. It was launched for the Xbox 360, Wii, PlayStation 2, and PlayStation 3 as a reformed and reworked take on the Sonic franchise, likely to counter criticism of the earlier 2006 Sonic the Hedgehog game. Sonic Unleashed sees the hedgehog hindered by a new "Werehog" form at night, and travels to both return to his normal form and stop Dr. Eggman from breaking up the world. Unleashed debuted with a rendering system dubbed by Sonic Team as the "Hedgehog Engine", designed specifically to handle the drawing of 3D geometry and environments in a fast-paced setting. As this suggests, Sonic Unleashed is a much faster game than its predecessors, being a mixture of 2D and 3D gameplay with the boost mechanic which debuted in Sonic Rush. This was the last Sonic the Hedgehog game released for the PlayStation 2 in Western territories (in Japan this title goes to Sonic Riders). The story starts as Eggman's battle fleet is in orbit around Earth, and Sonic goes to stop him. Using one of his robots, Eggman is eventually able to capture Sonic, only to have the robot destroyed as Sonic turns super. With his creation destroyed, Eggman flees with Super Sonic pursuing. Eggman lures Super Sonic into a chamber which rips the Chaos Emeralds from him and harnesses their power to break the world apart. This causes a beast to awaken from the center of the planet. Eggman's machine, however, caused some unintended side effects: The chaos emeralds are changed somehow, and they turn Sonic into a Werehog. Sonic then falls toward the broken planet, and meets a small creature who has lost his memory. Feeling remorse that he may have caused the creature's amnesia, Sonic decides that he must find someone who knows his new friend, and put the planet back together with the help of Tails, Amy, and Professor Pickle. In order to fix the planet, Sonic must find shrines (known as the Temple of Gaia) to reawaken the Chaos Emerald's positive energy and with their power, they will restore a piece of the planet back to surface. While restoring the sixth continent in Adabat, Chip regains his memory and reveals that he is actually Light Gaia, the opposite of Dark Gaia. The Gaias go through of cycle of the Dark breaking the planet and the Light restoring it . However, due to being released prematurely, Chip lost his memory and Dark Gaia was broken apart. Afterwards, Sonic and Chip reach EggmanLand with the help of Tails' Tornado bi-plane and get to the final temple. However, they are interrupted by Eggman and battle his Egg Dragoon. After defeating it though, a now nearly complete Dark Gaia rises from the Earth. Eggman orders Dark Gaia to destroy Sonic and Chip, but this backfires with Dark Gaia blowing him away. Dark Gaia then absorbs Sonic's Werehog powers, curing him of it. With no other choice, Chip calls all Gaia Temples and merges all of them together with him, creating the Gaia Collosus. The Gaia Collosus then begins to battle Dark Gaia and distracts him, giving Sonic a chance to attack. Sonic and Chip seem to have defeated Dark Gaia but Dark Gaia then transforms, engulfing the planet in darkness. Dark Gaia has became Perfect Dark Gaia. After Dark Gaia's transformation, the newly revived Chaos Emeralds then transform Sonic into Super Sonic and the final fight begins. In the 360 & PS3 version, you must get to Perfect Dark Gaia's shield and destroy it by defeating the Dark Gaia monsters that create it as Super Sonic and the rings fill in your Health Bar. Then, you battle Perfect Dark Gaia through quick time events. In the Wii & PS2 version, you must defeat Dark Gaia by collecting rings in order to do the Super Sonic Boost to attack Dark Gaia's eyes while dodging meteors at the same time. Super Sonic and Gaia Collosus defeat Perfect Dark Gaia and light is restored to the planet. Super Sonic, now having used up all his energy, loses consciousness and the time comes for the two Gaias to go back inside the planet. Chip's final move is saving Sonic by warping him to the planet. Sonic crashes and wakes up, finding Chip, but it turns out to be an illusion. Chip necklace, though, turns out to not be and Sonic puts it on as a bracelet, hearing Chip's saying that he'll never forget him and reminds Sonic that he is now part of the planet again. The game ends with Sonic speeding off with Tails flying behind him via the Tornado. Sonic travels over various levels, each of which takes place on a different continent. Unleashed contains two different styles of gameplay, noted by the separation of day and night, and of Sonic and his werehog form. In daytime gameplay, Sonic must race through various stages while dodging obstacles and destroying enemy robots, all while trying to get through the level in the most aesthetically pleasing way possible. Some levels contain branching pathways and semi-hidden areas where you can collect bonuses such as extra lives. As such, daytime levels have some light platforming. The 2d sections of the level design are reminiscent of the side-scrolling Sonic games. Sonic retains most of the moves he has in previous games, such as the wall jump, and homing attack. In addition he also has new moves: the Quick Step allows for Sonic to quickly dodge left or right, Speed Drift allows Sonic to turn around corners at high speed without slowing down, the Sonic Boost will increase Sonics speed and allow him to smash through objects and access different level paths. The PS3 and Xbox 360 version has a on-screen "Ring Energy" meter which displays how much boost is left, which can be increased by collecting rings. The PS2 and Wii versions of the game represent the "Ring Energy" amount with bars and is increased by performing "Action Chains" (attacking a string of enemies), or by collecting rings. In nighttime gameplay, Sonic transforms into a werehog where he moves substantially slower, but is much stronger. Additionally, his arms have the ability to stretch; useful in both attacking and in grabbing onto ledges, poles, and various other level elements. Thus, platforming gameplay is heavily emphasized. Another special move, called "Unleashed", increases the strength of his attacks for a limited amount of time. In most cases nighttime levels normally take longer to play than daytime levels, while daytime levels tend to be physically longer since Sonic is moving at a greater speed. Throughout the game, the player can collect Sun and Moon Medals which allow further level progression. In addition to the two gameplay types explorable "hub-worlds" are also available. These Hub-worlds are a bit different depending on the version played. The PS3 and Xbox 360 versions are 3D and fully explorable and contain townspeople to converse with. Side quests can be undertaken to gain experience or unlock items such as artwork, videos, and music tracks. Sun and Moon medals can also be found in these versions. These versions also have a hotdog stand, and somewhat amusingly the manuals allude to the fact that Sonic loves chilli dogs. This was mentioned in the American cartoons but was never mentioned in the games until this point. The PlayStation 2 and Wii versions feature a menu-based map system which players simply make menu selections to talk to townspeople and find information. The playable characters are Sonic and his new werehog form. Tails is also playable, although in mini-games rather than actual 'Sonic' gameplay. Chip is also playable as the Gaia Colossus in the final boss stage. Sonic the Hedgehog: Sonic's role in Unleashed is to put Earth back together by collecting the chaos emeralds and putting them in "Chaos Shrines" that reside every chunk of the planet. Sonic the Werehog: During the night, Sonic transforms into a were-creature (called "werehog" by SEGA) that, while looking sinister, still retains his will to do good. He cannot run as fast as he normally can, but in return he has enhanced physical strength and the ability to stretch his arms very long distances. Doctor Ivo "Eggman" Robotnik: Seemingly the cause of all the problems in this story. He turns Sonic into the Werehog, blows Earth into pieces, and unleashes the monster that has been living in the core of the planet for centuries. Chip: He is about the same size as a Chao and looks like a reddish-purple dog with wings. His purpose reflects that of Omochao, Tikal, the Duke of Soleanna (voice only), and Shahra, giving Sonic information as he runs along the stages. He likes chocolate and offers chocolate to every good person in the game, show both his kindness, and his hunger. Tails: Using his Tornado, Tails assists Sonic in traveling to the various continents. Amy Rose: Appears only in cutscenes, and is rescued by Sonic during a part of the game. Professor Pickle: Eggman captures Professor Pickle, and is later rescued by Tails. He is an odd scientist obsessed with cucumber sandwhiches and is very helpful to Sonic. Dark Gaia: Eggman splits apart the earth in order to use Dark Gaia to build his Eggman Empire. He is the final boss in the game, being fought by the Gaia Colossus and Super Sonic. "Sonic Unleashed" was trademarked by Sega on March 12, 2008. Screenshots of cutscenes and gameplay were posted on March 22, 2008 along with a video shortly after. The same site that first posted the screenshots later indicated that Sega had confirmed them as official material. It was originally intended to be the third installment of the Sonic Adventure series, but the development team began to introduce enough new innovations to separate it from the Sonic Adventure titles, and so the idea was dropped. In sections of the PlayStation 3 and Xbox 360 versions of the game, the player may choose to advance the time of day in order to play as either Sonic or the Werehog. The Wii and PlayStation 2 versions advance the time of day automatically. The Xbox 360 and PlayStation 3 versions of the game include the Empire City and Mazuri levels, while the Wii and PlayStation 2 versions contain only a limited version of Mazuri. The Wii version of the game also expands upon the ratio of night-time levels to daytime, with more than three times as many night-time levels (twenty-five in all). 360 and PS3 versions contain explorable hub worlds and town stages, while in the Wii and PS2 versions they are replaced by static backgrounds. Dimps, creators of the Sonic Advance and Sonic Rush series, handled the daytime level design in the Wii and PS2 versions of the game. This version of the game also features an entirely different engine rather than the Hedgehog Engine. Tornado Defense is not present in the Wii and PS2 versions. The level-up system in the Wii and PS2 versions only applies to the Werehog, and is far less complex. In the Wii and PS2 versions, the Interceptor enemy behaves differently. Instead of using lasers and creating shockwaves by slamming the ground, it uses its wheels to try to run Sonic over. The robot can also be attacked and defeated in the Wii and PS2 versions by boosting into it when the camera pans behind it. In addition, the day boss music begins to play when it is encountered in said versions. The Dark Guardian boss battle is vastly different between the two versions. In the 360 and PS3 versions, the player must move boxes to one side of the arena to defeat the boss, while stunning it occasionally and defeating the enemies it spawns. In the Wii and PS2 versions, the boss does not spawn any enemies and is more of a 1-on-1 fist fight. In Xbox 360 and PlayStation 3 versions of the game, rings are pulled into the bar that says Ring Energy. In the Wii and PlayStation 2 versions, rings simply disappears once touched by Sonic during day stages. The Perfect Dark Gaia battle is completely different between the two sets of platforms. The higher end platforms have a five part battle that consists of Super Sonic making his way to the boss, destroying the force field it ups up, and then freeing the Gaia Colossus from Dark Gaia's grip. The Colossus then must use a 60 button quick time event to block a point black laser shot, and then Super Sonic dashes to deliver the final blow. The lower end versions simply have Super Sonic dodging attacks and putting Dark Gaia's eyes out. Additionally, in the higher end versions, Super Sonic has a health meter instead of the traditional reliance on Rings found in the lower end versions. The Xbox 360 and PlayStation 3 versions have both voice language tracks included in the game disc and feature an option that allows to switch between both English and Japanese voice language, which is present in all the regional variations of both versions. While the game is entirely multi-lingual in all regional versions of the game, the text language is automatically defaulted by the console language settings. The Wii and PlayStation 2 versions feature only one voice track in the game disc and according to the regional version, due to size constraints. The Western versions have the English voice language whereas the Japanese version has the Japanese one, while the text language is entirely multi-lingual in all regional versions. Since the PlayStation 2 version was never released in Japan, this version lacks the Japanese voice language completely. The text language is entirely multi-lingual and manually selectionable in all the regional variations of both versions, although the Japanese text language is manually selectable in the North American PlayStation 2 version; in the European and Australian PlayStation 2 version it can only be accessed if the console language settings are in Japanese. Several Stages in the Xbox 360 and PlayStation 3 version of the game have a downloadable "Adventure Pack" which gives the game some replay value. These include Empire City & Adabat, Apotos & Shamar, Mazuri, Holoska, Spagonia, and Chun-nan, that also give a 'Hard mode' to the original stage, however, this got critical reception due to being most Sonic games having these modes included with the original game, such as Sonic Adventure 2, Shadow the Hedgehog, Sonic the Hedgehog and others. SA-55 (Ergo Robot) Chris Collet ?? This page was last edited on 13 April 2019, at 18:33.